Wild garlic has many names, ramsons, buckrams, broadleaf garlic to name but a few. Unlike the cultivated garlic we are all very fond of it is the leaves that are much prized. Wild garlic does produce a ‘bulb’ however it is very small. It is in season for around 3 months, April through July so don’t blink or you will miss it. Unsurprisingly wild garlic tastes like garlic, but it is a little brighter in flavour. It can be used in everything from salads through to sauces and is a real treat. It is now highly prized by cooks and chefs alike in Europe but at one point in time, it was used for cow fodder. The result was a highly prized Swiss garlic butter, how cool would that be? When it gets to the end of the season I actually try and get a lot and turn it into garlic butter. It adds a real freshness to my garlic spaghetti with blue cheese recipe! 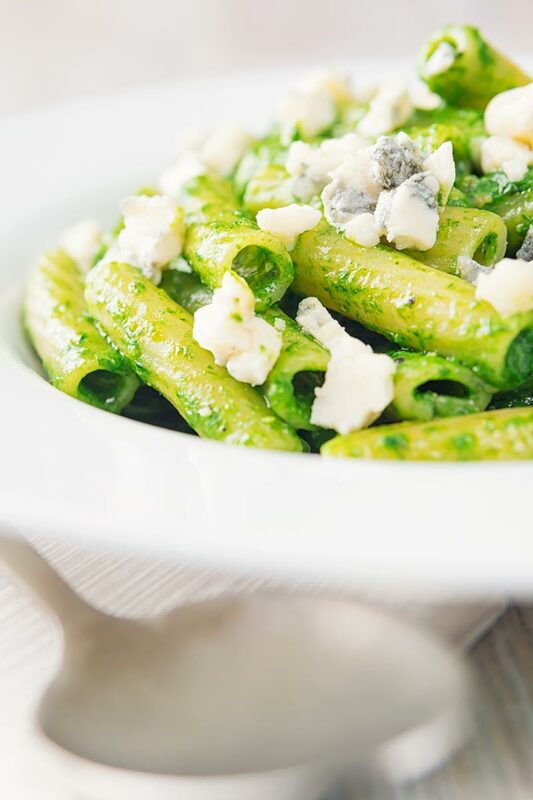 For me, one of the finest ways to use wild garlic is in a wild garlic pesto. 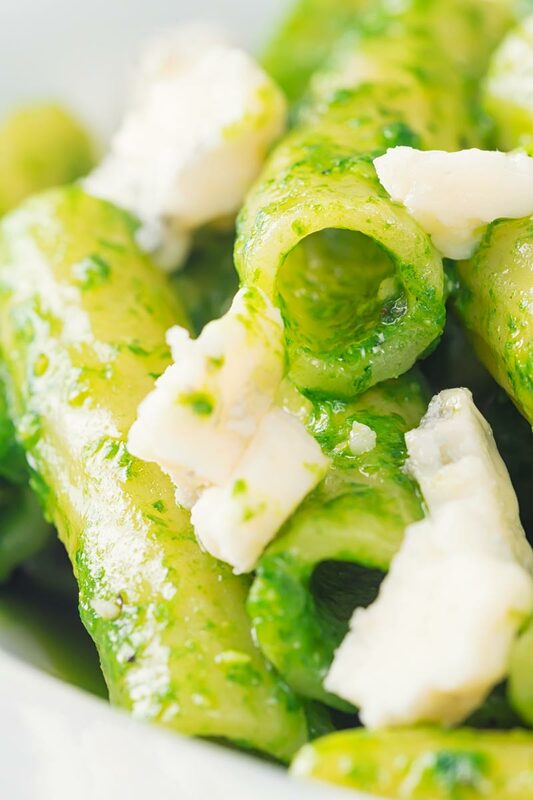 There is of course nothing wrong with basil pesto, it is fantastic! 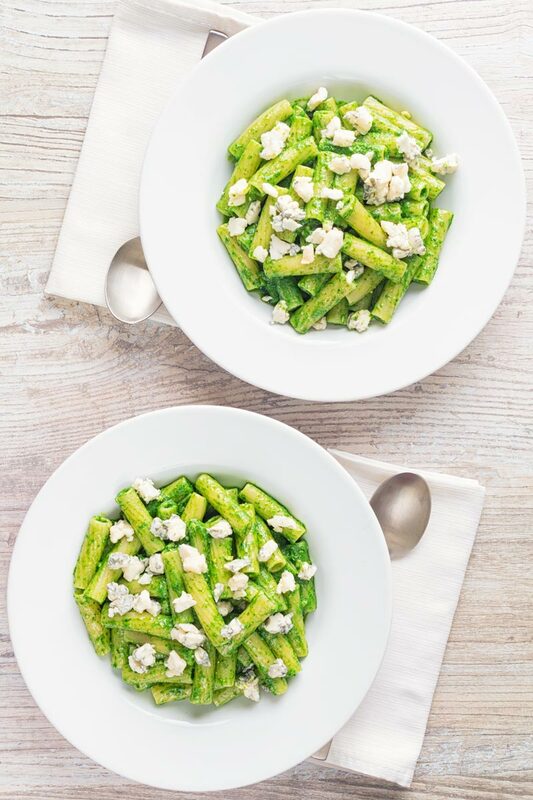 You can find my recipe for it in this pesto spaghetti with goats cheese recipe. 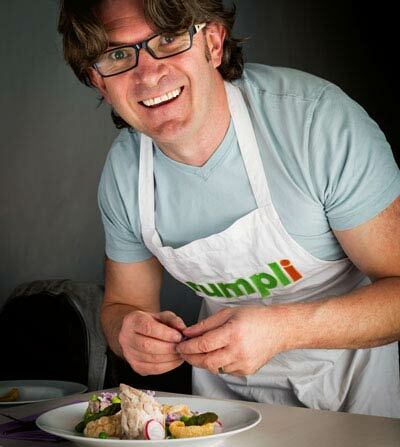 There is never a binary choice in food, there is always room for more! My recipe does not just swap out wild garlic for basil. Wild garlic can be incredibly overpowering if you use too much, just like bulb garlic. It has an almost fizzy effect in the mouth if overused and gives an almost ‘numbing’ sensation like cloves. So in this recipe, we add a load of wild garlic, some basil… Well, it is a pesto after all, and a smidge of parsley. As for preparation chuck it in a blender and blend! And the pinch of sugar? Well, that is a tip I picked up from watching Massimo Bottura and it is genius. It just counteracts that slight bitterness of the herbs! I usually serve my pesto sauces with a long pasta like spaghetti or linguini as in this pesto pasta with potatoes and green beans. But I always much more generous with wild garlic pesto and serve much more than I would a regular pesto. As a result of this, I find a shorter pasta with a greater surface area is preferable. Here I have gone with rigatoni, but it would be great with penne, fusilli or any other pasta with lots of places for the sauce to hide. If you want another idea then how about stirring it into some soup to really pimp it up! 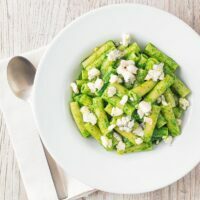 The season for wild garlic is short but truly magical, this wild garlic pesto pasta is the perfect fast spring/summer recipe. Cooking just 10 minutes with 10 minutes prep means it is a fast, vibrant and beautiful seasonal recipe. Begin by toasting your pine nuts in a dry pan. Drop your pasta into boiling, generously salted water. 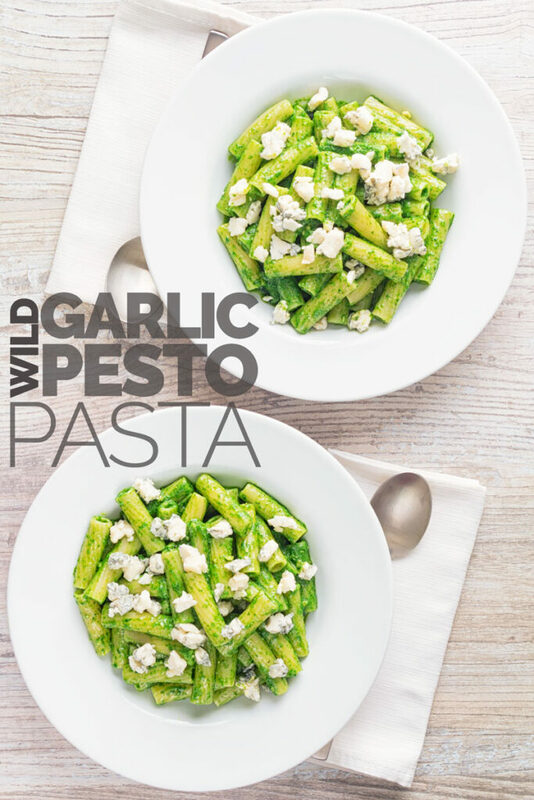 Put the wild garlic, basil and parsley to a blender whilst your pasta is cooking. Add the Parmesan cheese, a good pinch of black pepper, a small pinch of sugar and the oil. Blend to form a pesto adding more oil if required. When the pasta is cooked drain it reserving a little of the cooking liquid. 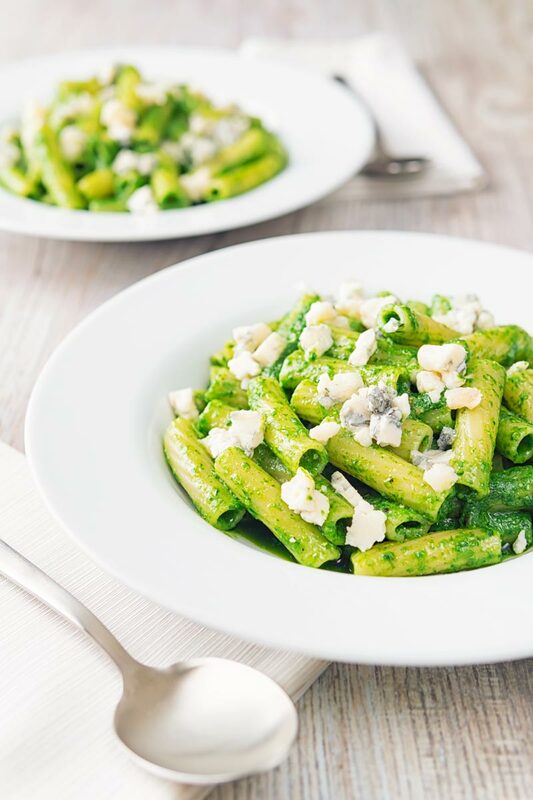 Stir the pesto through the pasta. Adding a little of the reserved cooking liquid to form a nice sauce texture. Have a taste and season with salt as required before serving. Oh my! This pasta dish looks so Good! I love the creaminess of it, and I think you can never have enough garlic! You had me at Gorgonzola! This pasta sounds amazing! Now I’ll be on the hunt for wild garlic. I love a challenge. And I’m totally stealing your pinch of sugar in the pesto trick! I would love to claim that hint but it comes courtesy of a 3 starred Michelin chef 😉 hehehehehe! The closeup of the pasta looks absolutely astonishing! And that wild garlic must be giving the dish so much flavour – perfect choice of ingredients. This looks incredible! That gorgonzola on top is perfection. My kind of meal! Oh my word! This pasta looks scrumptious! I don’t think we have any wild garlic on my property. I will have to see if I can find some at the farmer’s market! I hope you can find some it really is a magical ingredient that I love very much!